This 1908 Dwig card, which the reverse says is part of Series 21, is copyrighted to Charles Rose on the front, but the back has the logo that I associate with R. Kaplan (the guy in the smock with the Swiss cross, holding the beer stein and U.S. flag). I'm obviously misreading the tea leaves here -- can anyone shed some light? This logo is a take-off on the City of Munich, Germany coat of arms, which shows a monk holding a book in his left hand. This makes sense since the city's German name, München, means "of Monks." German printers made most of the best early 20th century postcards. The Ottmar Zieher printing concern, of Munich, used a similar monk logo. This card's logo with the stein and US flag suggests a Munich-based printer - R. Kaplan? - that printed / manufactured postcards for the US market. Lots of them did. As to Chas. 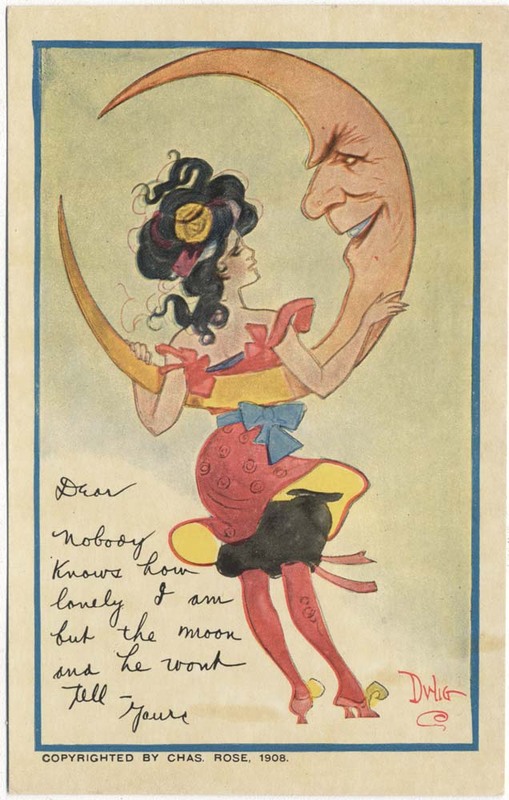 Rose, he (a) owned this image that Dwig drew for him, or (b) was the postcard's "publisher" which means the distributor to retailers, or (c) both. Thanks Frank, I didn't realize that postcards were in the same realm as books, where the printer and publisher can be (and often are) two different companies. That makes a lot of sense.